How many stayed up or woke up early August 4th and watched the live 20th Anniversary Special Act 2 broadcast? I was able to catch the live broadcast personally, but for those who were unable to, it will be posted August 11, 2013 to watch. Many were hoping for news about the anime, and while some did arrive, the majority of the discussions were about the new musical and products being released. The most important topic discussed for many was the anime, especially in regards to the release date. In summer 2012, Kodansha and Naoko Takeuchi announced that the anime would make its premiere in Summer 2013. That time has come and gone, and the release date was pushed back to the Fall of 2013. During the broadcast, it was confirmed that it will be released during the winter quarter. It was also promised that it will be released worldwide at the same time. This will be accomplished by streaming through Nico Nico Douga. No word yet on if there will be subtitles, but Editor Fumio Osano, Naoko Takeuchi’s editor at Kodansha, noted that they will be keeping international fans in mind. Typically, to access premium material like Sailor Moon, you need a premium account, which is only available to Japanese residents. But Osano confirmed that anyone will be able to view it, regardless of their location. No new information has been released about the voice actors, as Usagi’s voice actor has not yet been confirmed. It was also announced that Momoiro Clover Z will be doing the ending for the new anime in addition to the opening. During the broadcast, they performed Sailor Moon‘s famed opening, “Moonlight Densetsu,” via satellite at one of their concerts. There were originally several ending for the 90s anime so it is really anyone’s guess as to which one they may use, if any at all. The fan favorite at the moment is La Soldier which is an overarching song from past Sailor Moon musicals. Near the end of the broadcast Osano, or lovingly refered to by fans as Osabu, took audience questions and when asked if the new anime will be based on the previous one, he answered, “Regarding the anime story: The new anime will be based on the old one, but it’s not a remake”. A large portion of the fan base, especially older fans are crossing their fingers for the new anime to follow the manga more closely and have a more mature tone to it. While there few details released about the anime, the main discussion was about the new musical La Reconquista. Cast members for Sailor Moon, Sailor Mars and Sailor Venus along with the four generals, Jadeite, Nephrite, Zoisite, and Kunzite sat down for an interview in full costume during the broadcast. There was much discussion about the choices to go with a strictly female roster, which is also known as Takarazuka in Japan. Several of the actors have portrayed men before and expressed during the interview that they are looking forward to doing so in the new musical. The costumes are wonderfully over-the-top, like always, but have a more modern and toned down appeal to them compared to previous musicals. 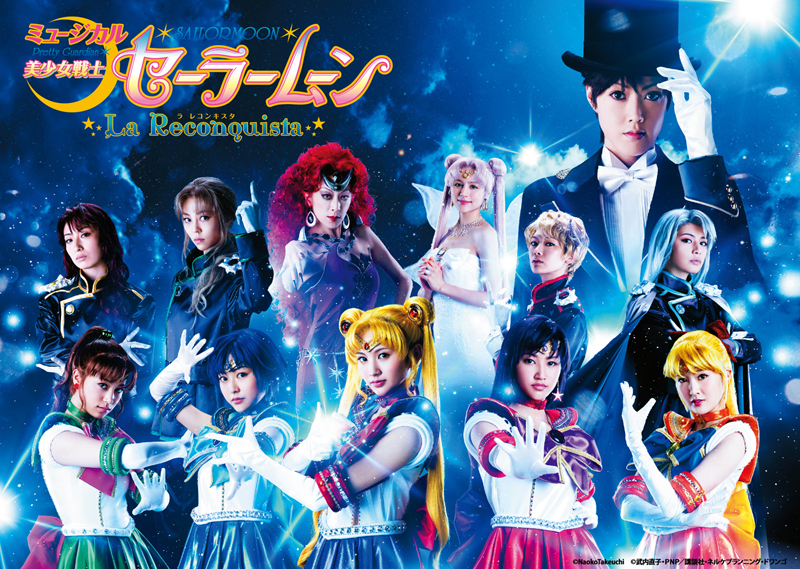 Sailor Moon: La Reconquista opens September 13, 2013 and runs until September 23, 2013 in Tokyo. Tickets went on sale last month for ¥6,800, which is about $67 USD. Naturally, to help promote the upcoming anime and musical, a new line of merchandise has been advertised. What has been announced was recapped during the broadcast with mentions of price, pre-order dates as well as where to order them. 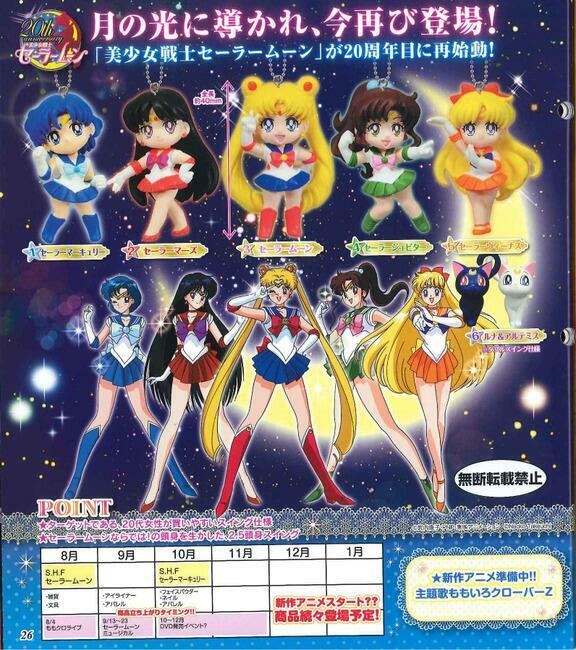 In addition to the already announced merchandise, new gashapon key chains were revealed. They will retail for ¥1000 for the set of five and will be available this coming October. October also brings about the re-release of the Sailor Moon manga, which will be published in the larger A4 size and will be full color. Winter is only six months away and fast approaching! With so much to keep fans busy, the anime will arrive in no time and will, without a doubt, be worth the wait.